William Cobb is one of the Old Masters of Alabama literature and his eight volumes of fiction have won a mantlepiecefull of prizes, including the Harper Lee Award. It would be understandable if this veteran writer continued to mine the material he is best known for—examinations of racial tensions in the South (especially his home place, Demopolis), coming of age stories, satire of cultural morés, often gothic or even surrealistic in style. His characters have often been struggling blue-collar families or Black Belt aristocrats gone to seed. But, in fact, with A Time To Reap Cobb has chosen to strike out in, what are for him, some bold new directions. First he has contracted with a new publisher, SixFinger , based in Chichester, England, with offices in Sarasota, Florida. With his new publisher Cobb first released a fine collection of previously published work, Sweet Home: Stories of Alabama (2013). This volume is being marketed like contemporary music. Readers may download the entire volume or a single story. And, especially in the U.K., teachers may order a cluster of three or four stories online and teach a unit on Southern fiction in their American literature surveys. Cobb’s new novel is also innovative, for him, in several ways: the setting, the socioeconomic status of the characters, and the use of battle scenes, in this case in Vietnam. 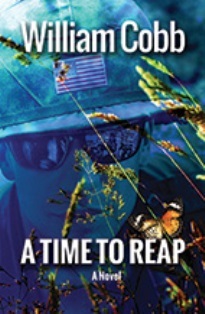 A Time to Reap is set in fictional Bay Springs, Louisiana, in 1965, and tells the story, in five voices, of the Founier family, who are, individually and collectively, going through hell. Mrs. Founier, Olga, is the high school band director. She opens the novel by skydiving onto the football field to begin the Friday night game against Parrish High. Olga tells us the official reason for the jump is to get her fine marching band some attention, but “the real reason was I wanted to do something outrageous, something daring, something shocking.” She wants to do something that will change the direction of her life because, we learn, she has recently lost a breast to cancer, has become an alcoholic, and her husband Patrick, also an alcoholic and unable to cope with the stress, was wildly unfaithful and has left her. Although too old to be drafted, Patrick has impulsively enlisted, and is now a private in the U.S. Army, fighting in the jungles of Vietnam. The Founiers’ three children, Willie, Deirdre, and Max, ages 14-17, are somewhat embarrassed by their mother’s skydiving, but they have much more to deal with. Besides the regular stresses of adolescence—getting crushes on other teens, feeling alone and misunderstood, trying to fit in, and having a mother the town is talking about—they all, especially Deirdre, worry about their dad. “Mixed feelings” won’t handle it. They love Patrick, are furious that he left, and are crazed with worry for his safety. Cobb does a masterful job of describing Olga’s drinking problem. She goes to AA but admits, right there at the meeting, that she does not yet want to quit drinking. Her life is so painful and difficult. She says, honestly, “booze is my best friend. You can always depend on the booze. …It doesn’t let you down.” Olga is lonely and understandably tempted to accept some male company. She remains faithful but is still denounced as a harlot by the Rev. Means, a crazed, twisted preacher of a type we have seen in Cobb’s fiction before. Cobb’s finest achievement in this novel is the depiction of Patrick’s tour in Vietnam, in the field and on in-country “r and r” in Saigon. This is new territory. Cobb himself was not in Vietnam but the sweat, exhaustion, and terror are convincingly done. He has resisted the impulse to pile up presumably convincing details of Southeast Asian geography and insider military terms of art gathered from Wikipedia and instead handled combat scenes as Stephen Crane, also not a soldier, handled the Civil War battle scenes in The Red Badge of Courage. Cobb focusses on Patrick’s emotions: a powerful sense of dislocation, rage and confusion while under fire, grief when buddies are killed, and fear when coping with his own wounding. Cobb has made this all work. A Time to Reap is his best book yet.